Saturday night the Colorado Mammoth (1-3) defeated the Calgary Roughnecks (3-4) 12-7 in front of 11,101 fans at the Pepsi Center for their long-awaited first win of the season. Ryan Benesch (3G/4A) and Eli McLaughlin (2G/4A) led the way for the Mammoth offense. Colorado struggled during their first three games, only holding a lead for just over 11 minutes. 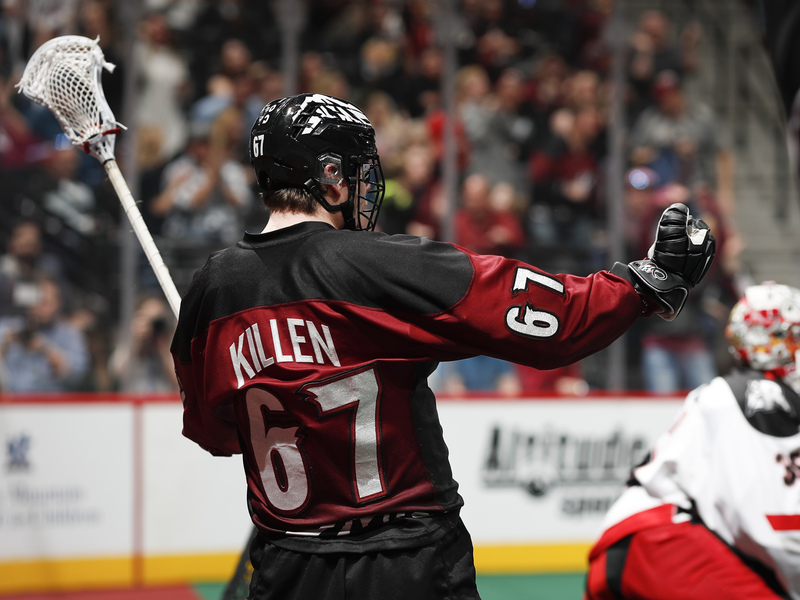 Colorado’s 2018 second-round pick (22nd overall) Kyle Killen scored his first two career goals in highlight-reel fashion. His first came off a beautiful pass from Jeremy Noble. Killen took the pass and dove forward through the crease beating Christian Del Bianco. His second goal was another thing of beauty as Killen received a pass from McLaughlin on his back hand before depositing the ball into the net. But it just wasn’t the offense that clicked. The Mammoth defense came up huge in this game. Calgary turned the ball over 31 times, 21 of which were caused by Colorado’s defense. Colorado also only allowed the Roughnecks to get 39 shots on Dillon Ward while they peppered Del Bianco with 52 shots. Colorado converted three times on the power play on nine attempts. Even though the power play didn’t have a lot of success, it was the factor of Calgary taking nine of the final 11 penalties called. Being shorthanded for almost 18 of the final 35 minutes will eventually take its toll, and Colorado made sure it did. The Mammoth held Curtis Dickson and Dane Dobbie to a combined (1G/4A) on 16 total shots. Dillon Ward stopped 32 of 39 shots faced to pick up the win, while DelBianco stopped 40 of 52 shots faced. The 12 goals allowed by Del Bianco are the most he has allowed in his career when facing Colorado. This was an important win, not only for the Mammoth to collect the first of the year, but it also tied their season series with Calgary at a game apiece, something that could have playoff implications down the line. The final matchup in the season series will be in Calgary on March 16th. After losing their opener to Vancouver, Calgary went on a three-game winning streak to put them on top of the Western Division. Since then they have dropped three in a row and fallen to third place in the west. Calgary is off next week as they prepare to host Vancouver, against whom they fell 14-13 in the season opener before beating them the next week 14-8. Colorado will now go on a three-game road trip starting with Vancouver (1-5) on Saturday night before traveling to Buffalo and Philadelphia before returning home on February 16th to face the Georgia Swarm.